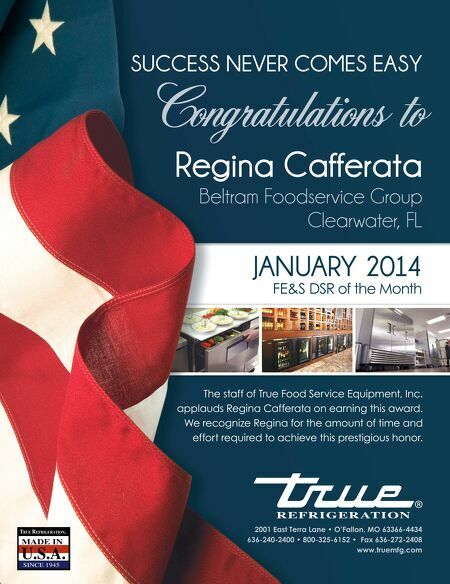 JANUARY 2014 • FOODSERVICE EQUIPMENT & SUPPLIES • 75 DSR of the month Regina Cafferata , Negotiated Sales Beltram Foodservice Group, Clearwater, Fla. By Lisa White, Contributing Editor F or Regina Cafferata being a successful DSR seems to run in the family, as her husband John is a former DSR of the Month. After meeting John, a third-generation restaurateur, in college, Cafferata briefy worked as a fight attendant. She then went to work in his family's restaurant. "I discovered my experience as a fight attendant was a natural ft for the foodservice industry," Cafferata says. She moved from Missouri to Florida to join a nationally franchised chain. During this transition, an opportunity with Beltram Foodservice Group was unveiled. 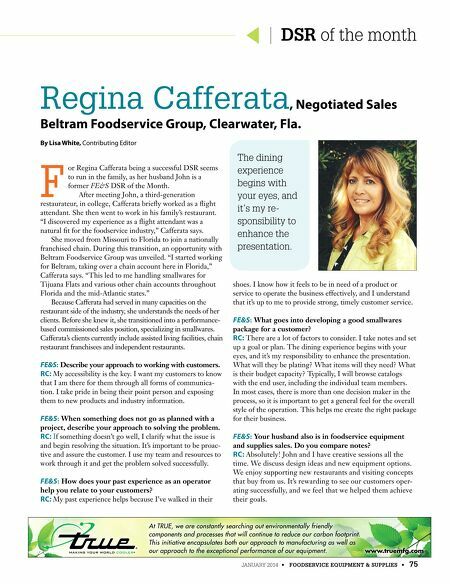 "I started working for Beltram, taking over a chain account here in Florida," Cafferata says. "This led to me handling smallwares for Tijuana Flats and various other chain accounts throughout Florida and the mid-Atlantic states." Because Cafferata had served in many capacities on the restaurant side of the industry, she understands the needs of her clients. Before she knew it, she transitioned into a performance- based commissioned sales position, specializing in smallwares. Cafferata's clients currently include assisted living facilities, chain restaurant franchisees and independent restaurants. FE&S: Describe your approach to working with customers. RC: My accessibility is the key. I want my customers to know that I am there for them through all forms of communica- tion. I take pride in being their point person and exposing them to new products and industry information. FE&S: When something does not go as planned with a project, describe your approach to solving the problem. RC: I f something doesn't go well, I clarify what the issue is and begin resolving the situation. It's important to be proac- tive and assure the customer. I use my team and resources to work through it and get the problem solved successfully. FE&S: How does your past experience as an operator help you relate to your customers? RC: My past experience helps because I've walked in their shoes. I know how it feels to be in need of a product or service to operate the business effectively, and I understand that it's up to me to provide strong, timely customer service. FE&S: What goes into developing a good smallwares package for a customer? RC: There are a lot of factors to consider. I take notes and set up a goal or plan. The dining experience begins with your eyes, and it's my responsibility to enhance the presentation. What will they be plating? What items will they need? What is their budget capacity? Typically, I will browse catalogs with the end user, including the individual team members. In most cases, there is more than one decision maker in the process, so it is important to get a general feel for the overall style of the operation. This helps me create the right package for their business. FE&S: Your husband also is in foodservice equipment and supplies sales. Do you compare notes? RC: Absolutely! John and I have creative sessions all the time. We discuss design ideas and new equipment options. We enjoy supporting new restaurants and visiting concepts that buy from us. It's rewarding to see our customers oper- ating successfully, and we feel that we helped them achieve their goals. At TRUE, we are constantly searching out environmentally friendly components and processes that will continue to reduce our carbon footprint. This initiative encapsulates both our approach to manufacturing as well as our approach to the exceptional performance of our equipment. www.truemfg.com The dining experience begins with your eyes, and it's my re- sponsibility to enhance the presentation.